Get involved join TeamDSF and make a difference, bring awareness and help us to find a cure for Essential Tremor. By making a donation of any amount, every donation counts, you will be actively advancing awareness and medical research to find a cause and cure for movement disorders. We encourages our supporters/volunteers to think laterally and to use their own unique skills to develop a fundraising event in their community. The people who do this not only raise funds but also much needed awareness within the community. Team DSF exists to raise funds and awareness for the Diann Shaddox Foundation for Essential Tremor. Our staff is dynamic and diverse. Our skills are different, our professions are varied; but our mission is the same: support and find a cure for ET. It’s more than a job; it’s a place where you can do what you love, and love why you do it. Some of us aren't quite physically blessed or genetically inclined to run a marathon, participate in a grueling agility course, or climb a mountain to raise funds, but it doesn’t mean that we are any less important in the big picture. Volunteers are critical to the success and survival of DSF. DSF could not fund a fraction of our programs without the support of our corporate partners. We work closely with these partners to develop mutually rewarding relationships. The Diann Shaddox Foundation volunteer internship provides college students with hands-on experience in a fast-paced, entrepreneurial nonprofit organization. The interns receive academic credit through an already established educational program at an accredited college or university. What is TeamDSF? 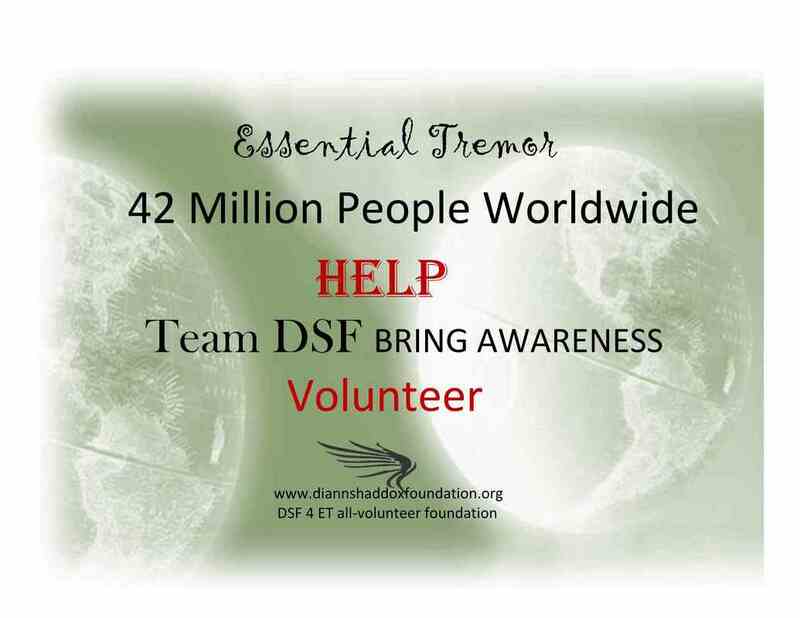 TeamDSF is the fundraising/Volunteer program for the Diann Shaddox Foundation for Essential Tremor to help us bring awareness and assistance for anyone with ET. Turn passion and interest into unique fundraising events and athletic feats. You can make a difference, no matter how small the fundraiser. You can start a fundraiser to raise funds for TeamDSF in any amount you would like. Use your own interest to start a fundraising event now and donate your time. Leaving a gift in your Will or making a personal contribution in memory of a loved one is an incredible way of supporting a cause near and dear to your heart. Shop at DSF store Don't forget to shop at DSF store. The sale of the merchandise go to help fund awareness and assistance programs. Run, walks, cake sales, galas, art sales, etc. Tell Your Story of Living with ET. Join Team DSF! DONATE your TIME! Take part in our community and get involved. ​By joining you opt in to receive emails from Diann Shaddox Foundation. Amazon will donate 0.5% of the price of your eligible AmazonSmile purchases to Diann Shaddox Foundation whenever you shop on AmazonSmile it will automatically populate all your account info to it as well as order history.